Very pleasant experience. He’s very humble and polite and explains everything in detail. Never pushes for any treatment. 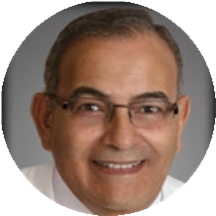 Dr. E. Edward Azab is eager to put his education, skills and experience of over 30 years to use for you. Whether you need a complete smile makeover, urgent care, or just a quick attention, Dr. Azab is dedicated to meet your needs. Dr. Azab provides a full array of cosmetic, surgical and restorative dental services for our patients; including crowns, bridges, dentures, root canal treatment and surgical extractions of wisdom teeth. Dr. Azab is member of the American Dental Association, Academy of General Dentistry and Chicago Dental Society. He is overall wonderful. Gentle, caring and the best bedside manner I have ever come across. He's definitely our #1 Dentist. Very nice and friendly staff. They were accommodating and helped answer any question I had. I went for general checkup and cleaning, but found some extra issues and the doctor provided guidance on treatment. It was a pleasant experience! Fast, clean and painless. It was my first time at this office, no waiting , very nice customer service. Not to mention Dr. Was great!! I felt very confortable . Would highly recommend. They are very nice people who are patient and caring. I can only say that he deserves 10 stars Best dentist ever. The office staff is very friendly and efficient. I sensed I could trust Dr. Azab's opinion and advice. I was referred by a family member for his skilled and professional work. This was my first visit there and absolutely loved it. I am one among many who hate going to the dentist. I have to say that this was the best experience I have had since my recent dentist has moved away.The girls at the desk were great and went above and beyond what was expected. Dr. Azab and his assistant was great. Very professional, gentle and explained everything to me not to mention how comfortable they made me feel. I found a keeper and one who I will trust doing what needs to be done with my dental needs. Hats off to them all. I literally love this man! I had a problem with a tooth that had been bothering me for almost two years. My previous doctor told me the tooth was okay. Dr. Azab pulled the abscessed tooth and said, "It should havebeen pulled two years ago". I also needed a new bridge, as the former dentist did a poor job. The bridge that Dr. Azab made for me is FANTASTIC! The tooth pain is gone, the infection in my system from that tooth is gone and I am healthier. And, on January 18, 2018 he put in a bridge that is absolutely BEAUTIFUL. My smile has NEVER looked to good! I thank God for this wonderful man. I have already recommended Dr. Azab to others because he is the best there is in his field. Very friendly. Everyone was taking care of me right away. The dentist was very nice. Made me very comfortable. Explained everything that needed to be done and how. He was not pushy like some are to get the business. I trust him with my teeth. Excellent experience, I was treated promptly and professionally with ease of pain and care! The whole staff is friendly and professionals, I loved my overall! It sure makes seeing the Dentist much less of a burden when it’s a true health necessity! I hadn't been to the dentist in over a year and this was my first visit with this dentist. The staff is super friendly and I felt very at ease. The x-ray machine and method is much more comfortable than the old in-mouth method my last dentist used. Dr. Azab is very professional with a sense of humor. I love that he does it all and you don't need to go to several different dentists to get the work done. I've had root canals, wisdom teeth, crowns, cleanings andX-rays done by him. He is always willing to work with you as far as payments and appointments. I highly recommend him to anyone and everyone!! Thank you very much Doctor!! The best dentist I have seen in many years. Thank you! He was great with my 8 yr daughter. He was also great with me and my big baby self of a 32 yr old?? Excellent Dentist with good bedside manner. I've been going to him for a long time for root canals, extractions, etc and have never felt any kind of pain. His extractions take less than 5 minutes no matter what condition the tooth is in. Dr.Emad Azab is the only dentist I can trust, he fixed all my teeth issues today without any pain, my visit was a fun trip not as a dentist clinic visit, the clinic is very clean, and the staff are veryprofessional thank you Dr. Emad for getting my teeth back healthy. My visit was excellent, thank you very much! Everyone there was really nice and I even got complimented on my oral hygiene which had never happened. I do take really good care of my teeth so it was nice for a dentist to recognize it and not tell me I need to floss. I was very pleased, Doctor and Staff were very pleasant and made me feel very comfortable. It went very well. The dentist always gives me a LOT of anxiety, but the nurses and staff were very friendly and smiled a lot which is relaxing. Dr. Azab was also very friendly and immediately made me feel as comfortableas possible. I was very nervous, but they took great care of me and walked me through everything. Amazing service. My visit for an exam and cleaning was very fast and dr azab was super nice made me feel totally comfortable. Def recommend him to anyone!?? Again in and out , and my teeth are finally being taken care of, thanks to Dr. Emad Azab. Thanks again! He was wonderful and his assistants as well. They made me instantly comfortable and I wasn't just treated like another mouth. He was patient with me and helped me get my wisdom teeth extracted really fast. I'd recommend Dr. Azab for any teeth issues. Short sufficient professional accurate precise . Perfect place for busy people who don't have all day to waste at a dental clinic.If you need to go it and out yet get excellent service in short time go there. Also a whileback I had my tooth pulled out it happened so fast that I had no time to be afraid.